The recent presidential election in Tanzania saw John Pombe Magufuli emerge victorious. His running mate was Samia Suluhu Hassan. The ticket’s victory gave the country its first ever female vice president. It is a rarity in Africa and the history making win did not go unnoticed. Chama Cha Mapinduzi (loosely translated from Swahili as party of the revolution); Magufuli and Hassan’s party faced the strongest competition it has ever faced in its long reign as the party that has been in power the longest in the entire African continent. The election outcome in Zanzibar still unresolved after the Zanzibar Electoral Commission nullified the election for what it termed as irregularities. The official explanation by the ZEC is that the vote was not valid “because it did not meet the threshold for a free and fair election.” The word on the street however is that CCM lost that election and CUF winning will threaten the union. CUF favors greater autonomy from the mainland. The fear is that a CUF victory might lead to the breakup of the union. The Zanzibar vote notwithstanding, the election of Samia Suluhu Hassan is historic. The two were sworn in on November 5 and have been in office for a week now. The last time the East Africa region had a female vice-president was across the border from Tanzania in Uganda over a decade ago. Specioza Naigaga Wandira Kazibwe was Uganda’s vice president from 1994 to 2003, stepping down in 2003 after it became difficult for her to perform her duties due to what was then a very messy divorce from her then husband. So after a long 12 years, East Africa has another female vice president it can celebrate. So who is Samia Suluhu Hassan? Hers has been a slow and methodical rise to the top. She graduated from Mzumbe University in 1986 with an Advanced Diploma in Public Administration. She continued on to the University of Manchester where she received a postgraduate diploma in Economics in 1994. She has demonstrated a proclivity for continual learning. This year with all the political temperature building up as the election neared, she received a received an Masters in Science in Community Economic Development through a joint-program between the Open University of Tanzania and the Southern New Hampshire University. In her native Zanzibar, she was the only high ranking female in president Amani Abeid Karume’s cabinet. Her entry into national electoral politics came relatively late by African standards. In 2010 she vied for a parliamentary seat in Makunduchi constituency winning handily (80%). Upon her win, just departed president Jakaya Kikwete appointed her Minister of State in the Vice-President’s Office (Union Affairs). She is married to Hafidh Ameir, tying the knot in 1978, a union that has been blessed by one daughter and three sons. Mr. Ameir is a retired agriculture officer and is currently a consultant. Their offspring are in careers ranging from business to information technology. The daughter is the only one to have followed in the mother’s footsteps. The daughter, Mwanu Hafidh Ameir, is a member of the Zanzibar House of Representatives. Many in the region are hoping that Samia Suluhu Hassan’s election is a sign of things to come. Will a woman rise to the presidency in any of the Eastern Africa countries? Only time will tell. The last time a woman ran a country in East Africa was in 1994, when Agathe Uwilingiyimanain served as Prime Minister of Rwanda (specifically from July 18 1993 until her death on April 7 1994). Hassan is used to doubters and she will inevitably meet some as she goes about fulfilling her new mandate as vice-president of Tanzania. She told a reporter last year that when president Karume appointed her to the cabinet in her Zanzibar, she was the only woman and the male colleagues looked down on her, however, “I stood my ground and eventually they appreciated my contributions.” Her competence at that first cabinet appointment in Zanzibar saw the number of female cabinet members rise to four, a development she describes with pride. “I have risen to this position as a result of my competence and not through favors,” she told the same reporter. 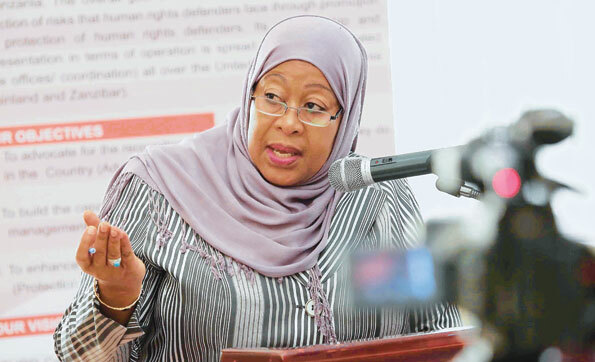 Given the manner her boss has gone about his duties since being sworn in last week, pushing for accountability and efficient service delivery from the civil service for example , the election and presence of Samia Suluhu Hassan might turn out to be a critical turning point not just for Tanzania but for the entire East Africa region. Tom is the President and Publisher of Mshale and chair of the Minnesota Multicultural Media Consortium (MMMC). As Mshale founder, he did a lot of the reporting during the humble beginnings of the newspaper. While he still does the occasional reporting, he now concentrates on the publishing side of the news operation.Tom was also the original host of Talking Drum, the signature current affairs show on the African Broadcasting Network (ABN-America), which was available nationwide in the United States via the DishNetwork satellite service. On the show, he interviewed Nobel laureates such as 2004 Nobel Peace prize winner, Professor Wangari Maathai, the first woman from Africa to win the peace prize and heads of states such as the president of The Gambia, Yahya Jammeh at State House, Banjul. Tom has previously served in the board of directors of Global Minnesota, the sixth largest World Affairs Council in the United States. He has also previously served as President of the Board of Directors of Books for Africa, the largest shipper of donated books to Africa and. He sits on the board of the United Nations Association.